Few places in the world can leave me silent in awe. Uluru is a place with deep power, far greater than you can ever hope to capture on film. It doesn't matter if you leave without the worlds greatest photograph of the rock, but there's immense joy in trying. After several visits in recent years I am still learning the nuances of this beautiful place. Here I share some locations and ideas for anyone planning to visit, and some updated information on the restrictions facing amateurs versus professionals. There are restrictions on where you can shoot in the Uluru Kata Tjuta National Park. Professional photographers are not free to sell, share or print whatever they like. Amateurs are also asked to show respect to the local community and their wishes, but are not subject to regulatory restrictions by the parks team. Access to the park itself presents many limitations as well for both amateurs and professionals. You can’t stop your car just anywhere, or take a walk wherever you like and the park closes about an hour after sunset. Regardless of whether you are a professional or not. 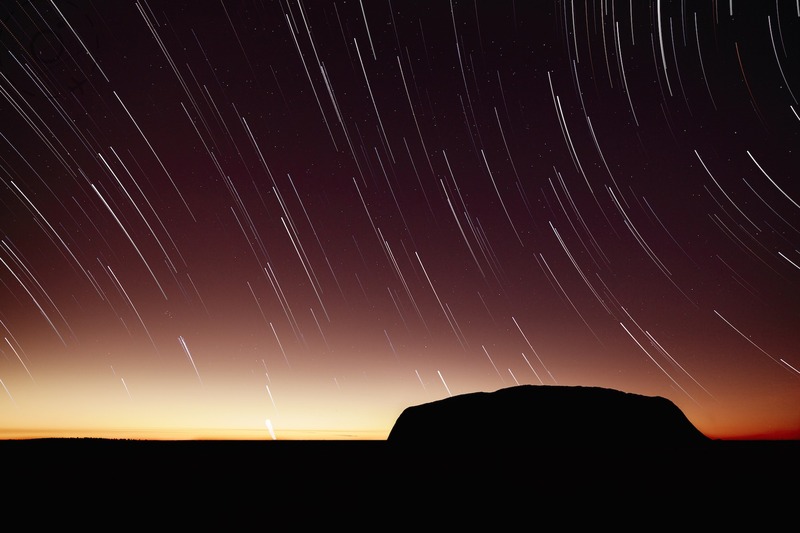 I have been lucky enough to be part of a permit trial that enabled me to shoot the Uluru sunrise star trail. It is my hope that in future, a wide range of people will be able to apply for a similar permit. The limitations on publishing images are due to cultural reasons. 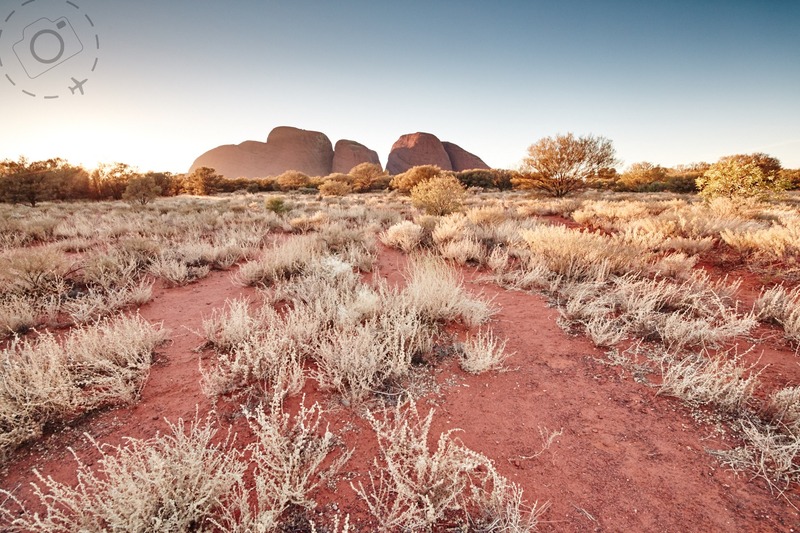 Uluru and Kata Tjuta are filled with sacred sites, some of which are believed to have the power to make people sick. The limitations on access to the park are due to practical reasons. With so many travellers visiting the park each year, the habitat and cultural value of the landscape would quickly be destroyed if left unchecked. Are these limitations the death of creativity for photographers? Not at all. Are they frustrating to the typical landscape photographer? Of course. But the fact is that you can come to Uluru and capture some beautiful images. Lots of beautiful images. Enjoying the experience of being here requires a change of attitude. The typical landscape photographer is used to moving through a landscape, step by sep, in search of the ideal foreground and a balance of elements. It’s a process that takes for granted the freedom to move, the freedom to step in any direction and point the camera in any direction. Photographing at Uluru, and respecting the wishes of the Anangu people, requires that you accept the limitations and commit to working within them. The cliche shot is sometimes a cliche for a good reason, because it works. The sunset viewing spot for cars is an old standard and an excellent one, with lovely clear views across red sands and flowering grevillea. Buses cannot enter this parking strip, and have to take their crowds further up the hill for views that are just a little too far away in my opinion. The sunset viewing is excellent, even with a crowd of people to share it with. Get in early to avoid missing out on a parking spot. A good 24mm lens is the go here, or a 35mm at the very minimum. You're pretty close to the rock in fact, and this location gives a good aspect on the height as the monolith emerges from the surrounding bush. I arrived here at 3pm one day and spent the next 2 hours watching the colours change, and the crowds too. Waiting for the very last light is not always best, depending on the clouds that day, and even at 3pm the photography is worth your effort. My advice is start early and keep shooting, as the combination of back-clouds, light intensity, colour of the sunset and smoky skies provide a fantastic variety of tones upon the rock itself and sky above. The major downside here is the shadows that start to creep across the foreground once you hit 4pm. It's around this time that I like to take my travellers to another spot to enjoy the last light in peace and quiet. If you stay here through the crowds you can get a rich red light filling in the rock at dusk, while the foreground landscape is tipped into the shadows. 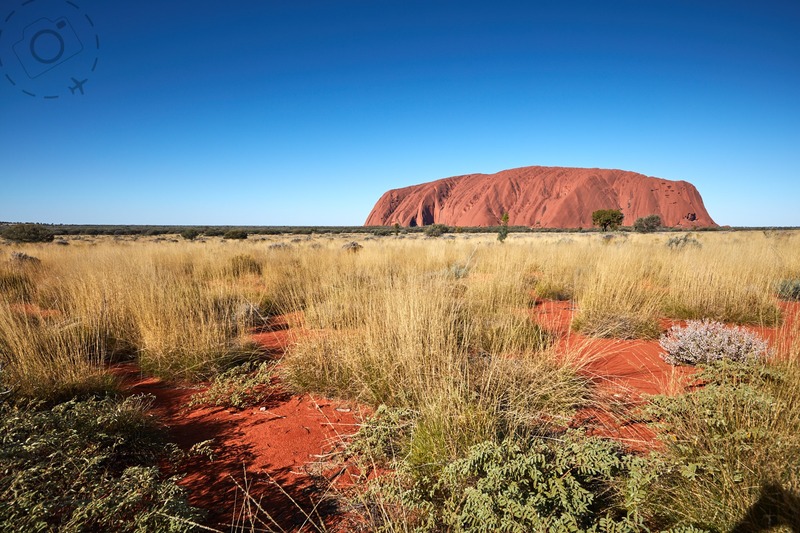 It’s one of the classic colours we think of when we talk of Uluru’s changing hues. You can also drive a little way beyond the sunset viewing carpark and pull your car over on the edge of the road for a private showing. So long as you avoid the yellow lines (applied for both safety and cultural reasons) and so long as you don't wander into the scrub, you can shoot the rock from the side of the road without breaching park guidelines. Sunrise was always a funny experience at the rock, with a particular stretch of highway becoming crowded with buses and motorhomes each morning. It was ratty and unruly, and faced towards some sacred areas of the rock. As of 2011 that has all changed with a new sunrise location developed to cater for large numbers, and much further away from the rock itself. They got almost everything right with the new location, with a few walking trails to disperse the crowds, ample room to absorb the vista, beautiful scrubland to compliment the rock and plenty of views to inspire the camera besides Uluru itself. Regrettably it lacks one thing, a good view of Uluru at sunrise. That's right, they put the viewing platform south of the rock and not nearly far enough to the east. For a few months of the year the angle of the sun puts some light directly onto the southern face, or so I'm told. Talinguru Nyakunytjaku is a lovely location and for many travellers it will make a memorable sunrise, and it keeps the crowds contained in a healthy way that protects the park. But photographers may be disappointed if they visit for the morning light. I last visited here for sunrise in May and at that time of year I had to wait for the sun to get a little higher before enough of the rock was out of the shadows. Walking around the trails at Talinguru Nyakunytjaku I found many spots where the silky-oaks gave me compositional inspiration, and I could let bits of the rock slip into the shot as well. What I do love about this location is the light at sunset, rather than sunrise. You will find very very people visiting at that time of day and the light cutting low across the horizon makes for extra drama. 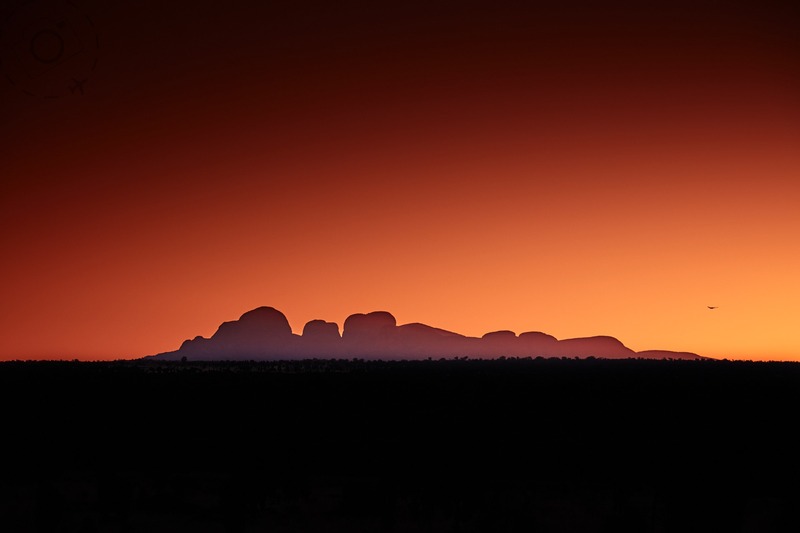 When the sun goes behind the rock, or edges onto the horizon, you can a bonus with vivid colours in the sky and refracted hues filling in Kata Tjuta. With a 200mm lens you can bring both into a single frame. 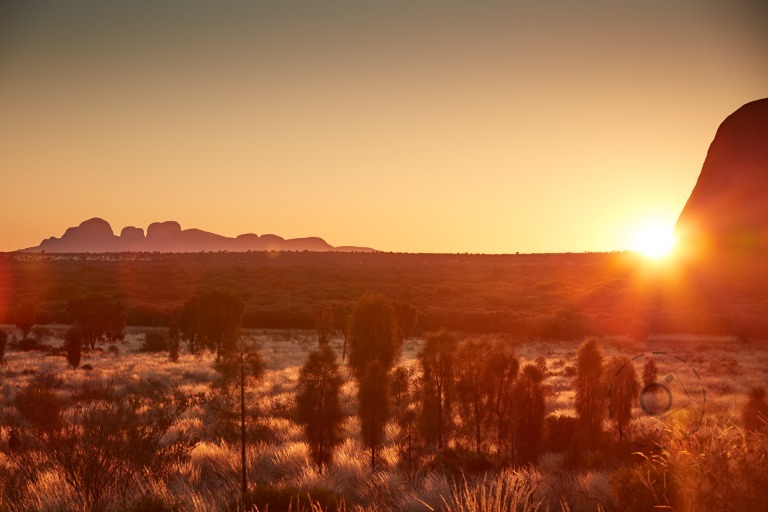 Formerly known as The Olgas but now recognised by its original indigenous name, Kata Tjuta is a place that the traditional owners treat with a little extra respect. They tell tales of people getting sick when they visit certain parts of the domes, and for the most part the indigenous people prefer to stay away. I can't explain it, but I don't enjoy being right inside the domes either. From a distance they look like a bag of pebbles, and shooting the domes as silhouettes works very nicely. A few years ago they built an elaborate viewing platform for Kata Tjuta, just 20 minutes from the park entrance. Regrettably it has no easterly or westerly profile, yet has been named the Kata Tjuta Sunrise/Sunset viewing spot. Go figure. Important for photographers to note that these domes are very difficult to photograph and stay inside the guidelines. You have to shoot the entire set of domes in a frame to satisfy the wishes of the Anangu people, which rules out some very nice landscapoe scenes from the viewing platform. Further down the road, closer to the domes of Kata Tjuta, is a less developed sunset spot for the big pebbles which offers no additional height on the vista but better light in the afternoons - if maybe a little too direct. From the carpark you walk 200m into the bush before the trail stops and the photos begin. The shrubs are getting pretty tall here, but this is where sunset light on Kata Tjuta looks its best. I was once told that any real landscape photographer carries a ladder with him, and I have to admit such a device would be handy in this instance. This spot is actually quite nice for sunrise as well, as the light comes from behind the domes and works a treat if you like a silhouette. One of my favourite things about Uluru & Kata Tjuta National Park is the unique flora. The red sands provide the most vivid of backdrops to these miniature tales of natural survival. Bits of timber weathered by time, leaves and grasses turned golden by the sun or precious flowers that challenge the desert for months after each rainfall. Some species here are also found in other parts of the country, but many are unique to the region and the combination of flora and landscape makes a lasting impression. Macro photography is worth your time out here, or just get close-up with your wide angle. A good 24mm lens with focus down to 25cm, giving you great emphasis on small detail while bringing in a little context from the landscape as well. There's no need to wander from the trails, and you're asked not to by the park management for obvious reasons. Walking the loop around Uluru can be a little too popular with tourists, who may not appreciate the strange sight of photographers lying on the dirt with a camera in hand. 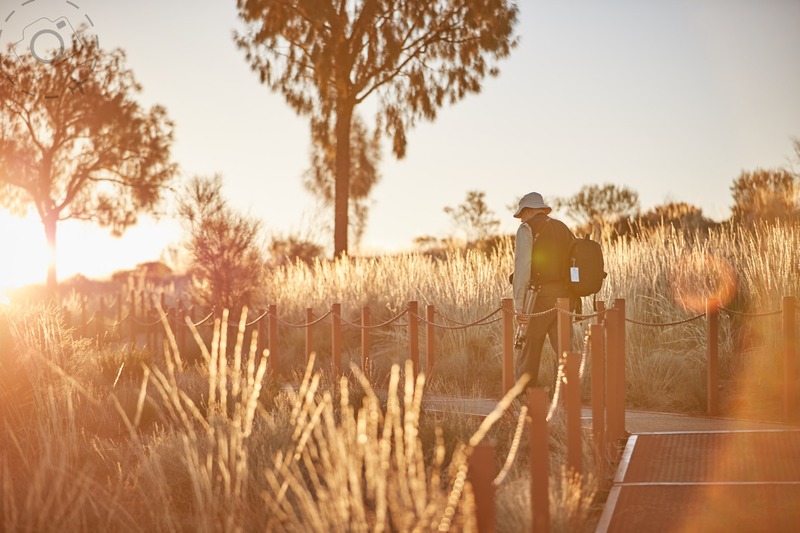 Less busy in the daytime are the trails at Talinguru Nyakunytjaku, and the two Kata Tjuta viewing locations. Both are good for focusing on the little things. Several kinds of grevillea taunted me from the roadside when last I drove about the park, especially the brilliant yellow blooms that always seem to be too far from the road or trail when I wanted a photo. These bits of detail add subtle colours to the desert. Silvery-green blades of grass contrast, rich red rivers of sand, brilliant yellow highlights from native wattle and grevillea, bright pink stars from succulents and subtle purple petals that hide under the scrub. Often it proved that I hadn't the time to stop and photograph flowers, I was racing for sunset and had no time left for the little things. Now I design more time into my workshops here so that all of my guests can spend some time chasing the little treasures. This comes back to one of my key ingredients to achieving your best photography - “go slow”. Taking the time to enjoy a location includes time to contemplate the flowers and find good light to shoot them with. The main thing lacking from most encounters at Uluru are the people. Tourists should not expect to even meet indigenous folk while in the park, let alone photograph them. Some guided tours work with indigenous people but it may as well be a 'cultural show' as far as photographers are concerned. The cultural centre is definitely worth a stop for interest and art. I even tried the "Sounds of Silence" dinner experience in the hope that it was a culturally significant experience. They bus people into restricted parts of the park where you watch the sunset and dine under the stars. It's a great experience, but your views of Uluru and Kata Tjuta and quite distant, and you can't leave the confined area to play with lenses and tripod. 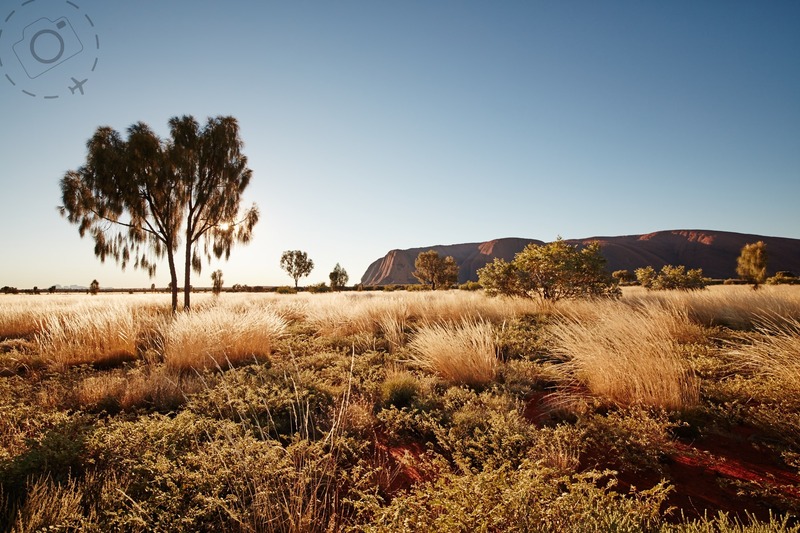 Traditionally the area around Uluru was not a place of residence, unclaimed by any single clan. Many groups came her for spiritual purposes only. This is why sacred places around the rock are so controversial for photography, as some places are believed to make the women folk sick, and some make men folk sick. Some make everybody sick. The indigenous owners believe that when you photograph these sacred places that you too can become sick. From this basis comes their protest about sacred sites, plus the deeply disturbing practice of climbing the rock. In recent decades there have been over 30 people die while climbing Uluru, and countless others who experienced difficulty due to too little or too much water. There's nowhere to take a leak up there, and some people simply go to the toilet regardless. Imagine if a bunch of Aboriginal folk visited St Paul's Cathedral in London, climbed onto the roof and took a whiz? It would be outrageous, yet this is basically what tourism has encouraged at Uluru. The park closes at 7:30pm in the winter time, which is about the point at which the stars make themselves visible. You can stay in the 'sunset viewing carpark' until about 7:15pm but you wont get to see all but the brightest of stars. Presently there is no simple way to apply for a permit to shoot in the park after dark. I was able to do this under a media permit as part of a trial. It is possible that in the future photographers will be able to undertake a training module and then apply for a permit that allows for similar access. Presently this is an idea, not a reality. 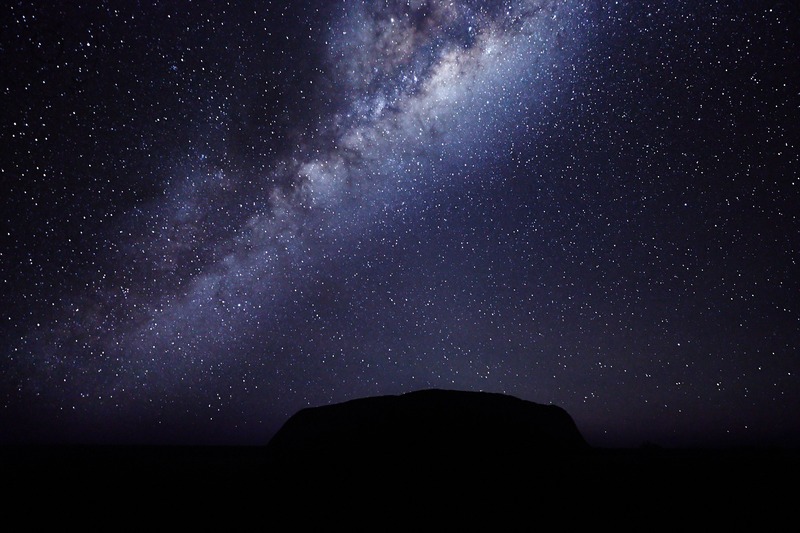 I will keep my fingers crossed, as the stars over Uluru is something that I find a compelling subject. Not just for the Milky Way and all it's brilliance, but for capturing star trails as well. 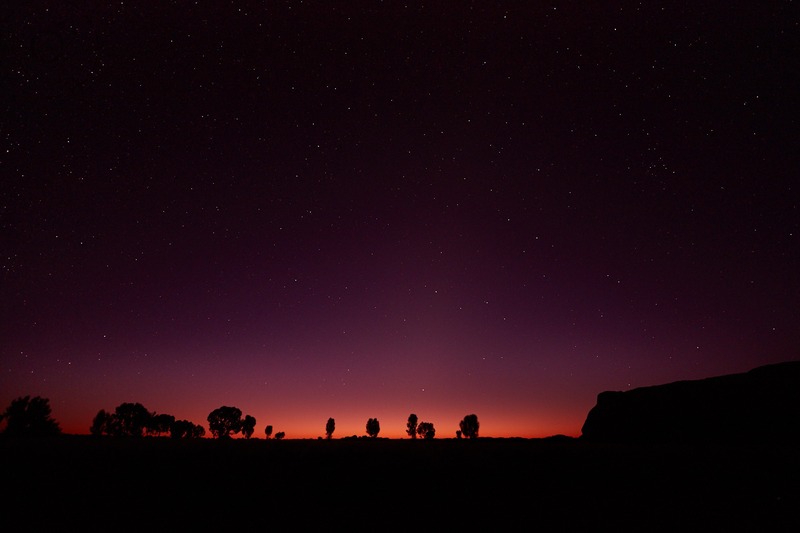 For years it has been a dream of mine to shoot the motion of the stars as they roll across the top of Uluru. That came true this year, and I captured a set of images taken at the 'sunset viewing carpark' before the dawn and into the sunrise. This image is a composite image using my 'brightframe' technique, although in this case shooting to the east insted of the west. Hence the sunrise situation instead of sunset. I wont tell you that I’m completely happy with the rules that are presently in place for Uluru. As a professional photographer I am under a great deal more scrutiny than the general public. It is clear to me that the parks people are trying very hard to engage with photographers, not simply present hurdles. But the fact remains that I have to go through an approval process before using any images I have taken in the park, while thousands of other people are sharing images to their social media that fail to meet the park guidelines. There are proposals in the air for new ways to deal with permits for professionals. Some of the proposed changes I’ve heard (and please note that my comments here are speculation, not fact) will create better opportunity for dedicated professionals to spend time in the park. The review process for images will likely remain. I can say from personal experience that a review process is pretty much essential. I have gone through the maps of sacred sites year after year. I know where they are, and yet I keep ending up taking pictures that reveal too much of sacred sites and hence fails to meet the guidelines. When you’re out there shooting you are thinking about composition and creativity, and not always giving enough attention to the content. One shot I submitted for review had the rock climb going on in the background, and I had completely overlooked that because my attention was on a simple tree in the foreground. Sometimes in our desire for an image we also interpret guidelines in our favour. The photographers perspective will always be different to that of the Anangu people. This is not your average 'compliance' issue. The review process is presently handled with dedication by the parks team. They clearly made every effort to help get my images approved quickly, at least the ones that met guidelines :) I’m still learning. One of the interesting things to note about restrictions on images of Uluru for professionals is that they apply regardless of where you take the photo from. Standing outside the park and shooting Uluru still requires a permit to use the image, as does images taken from the air. There are quite a few helicopter operators at Yulara airport and they’re all familiar with restrictions imposed on flight paths. You’re not allowed to buzz the community who live in the south-west corner of the park, and for most situations that means you can’t simply do a loop of the rock without checking in with parks first. The classic sunrise shot from the air is one I can’t show you here, because it presents one of the sacred sites in fine detail. What does look nice at sunrise is a backlit profile of Uluru with the waves of dunes reaching out towards the airport itself. Those first few minutes in the air, heading out to the western side of the rock, are fabulous. 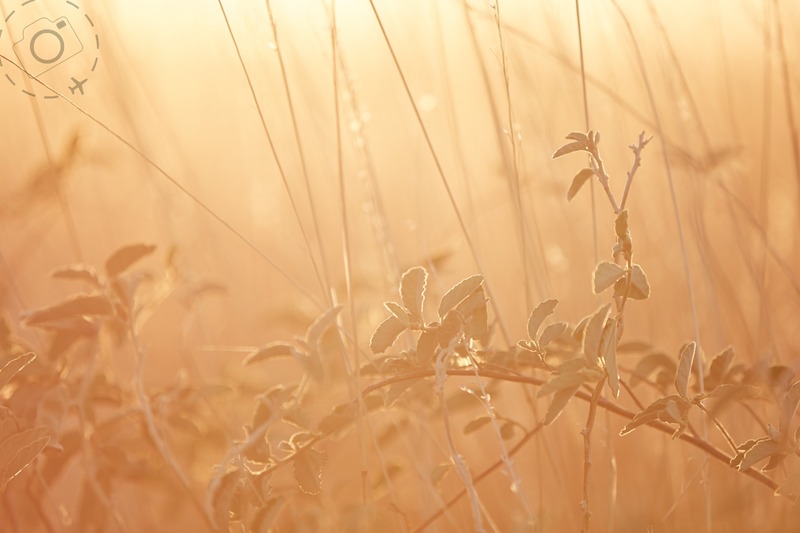 If you enjoy shooting into the sun with a little backlighting. Regardless of whether you pick the sunset or sunrise light, either way you will have issues with sensitive areas of the rock being highly visible. Kata Tjuta is a less complicated equation, but is further to travel by air. This is a bit of an issue if you want to shoot with the doors off, as your total airtime gets bumped up and you’re paying a lot of money to freight the chopper out to the domes. It also means that you need to pick your best light for one or the other. You have about 15mins flying time to reach Kata Tjuta after shooting Uluru, or vice-versa, so you wont be grabbing the perfect light at both. 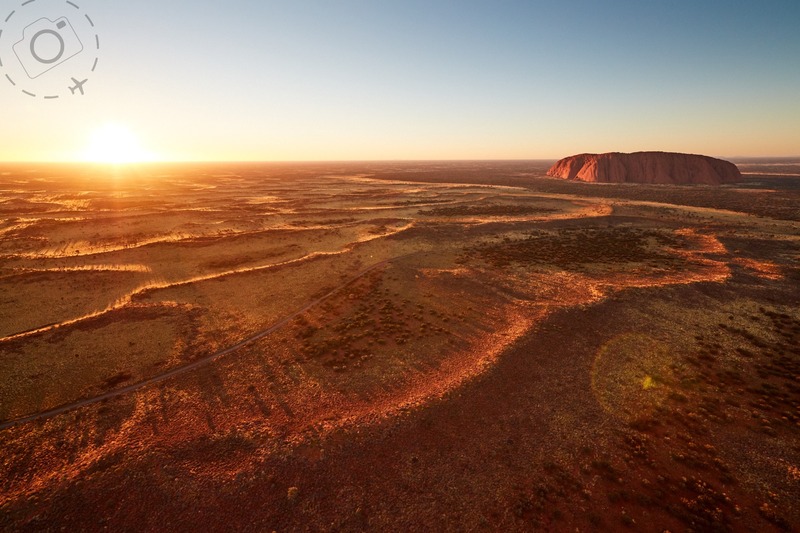 If you plan for a sunrise shot and get in the air just as the first rays are hitting the rotors, then you’ll have wonderfully soft backlight and the texture of the landscape to compliment the dramatic monolith of Uluru. And that’s what I love about the helicopter experience at Uluru, it offers the only way to truly appreciate the remarkable geology of the rock formations rising up from a quiet landscape. It really is beautiful and it really is unique. While driving the highways around Uluru you're advised to watch the speed limits, because without warning you may encounter camels and emus. Admittedly you will have to be very very lucky to find any living creatures here at the moment, because several years of good rains has left the red sand rampant with healthy grass cover for miles in any direction. The wildlife have better places to enjoy a meal if you want it. After several years visiting the park I have managed a few camel sightings. These wild beasts were introduced by the Afghans well over a century ago, and they have done very well in the Red Center. Emus are native of course, and are very wary of cars and people. I have only twice seen them in the park, and each time it was amazing. They have such mysterious faces, dark and hidden from the light. Their design looks like it came from the pen of an artist, elegantly curved and beautifully animated. I literally stopped breathing when I saw a flock of them just a few miles from the airport. The unexpected interlude was like a special gift from the spirit of Uluru, a present that was too special to be captured on camera. It felt like a gift to say thank you for respecting the spirit of the park. As I watched the emus run past my car, like a brilliant indigenous painting come to life, I felt a giddy surge of affection for this land and all it contains. The rock is truly inspiring, a place of immense energy and beauty. The landscapes are vast and compelling, rich in flora and fauna. If you plan to visit Uluru my advice is to spend your time well. Take it slow, give it respect and let the spirit of the rock guide you. If you're shooting for yourself then you don't have to worry about permits, but if you think you might want to sell the shots at a later date then you'll need to get permission first. Two steps come into play, firstly to obtain a commercial permit before you enter the park, and second to get each individual image approved before you sell it.